Schools, like any other business, produce lots of waste. We can cater for all your usual needs plus we can provide different solutions to suit you and your students. We work with several schools and have flexible terms in place for payment and collections, including a payment break in August, collection times outside opening hours and from different points around your site. We love working with schools and can even help you achieve your Eco Schools flag. These bins are used by the pupils in their playground, we find them to be really successful. We visit to empty them every week (out of school hours, of course). 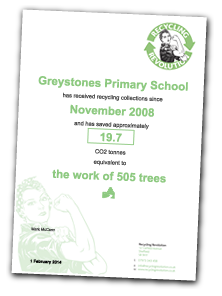 Recycling Revolution have transformed the way our school disposes of its waste! We have reduced our general waste and increased our recycling of cardboard, tins and plastics; saving us money, improving our environment and positively impacting on the learning of our children and young people! The Recycling Revolution Team are VERY friendly, VERY helpful, VERY flexible and understand the needs of our school!